ShopEasy is a Shopping Assistant for Chrome browser to improve your shopping experience at prominent shopping sites in India. Instantaneously search for an item in multiple sites of your choice in one click. 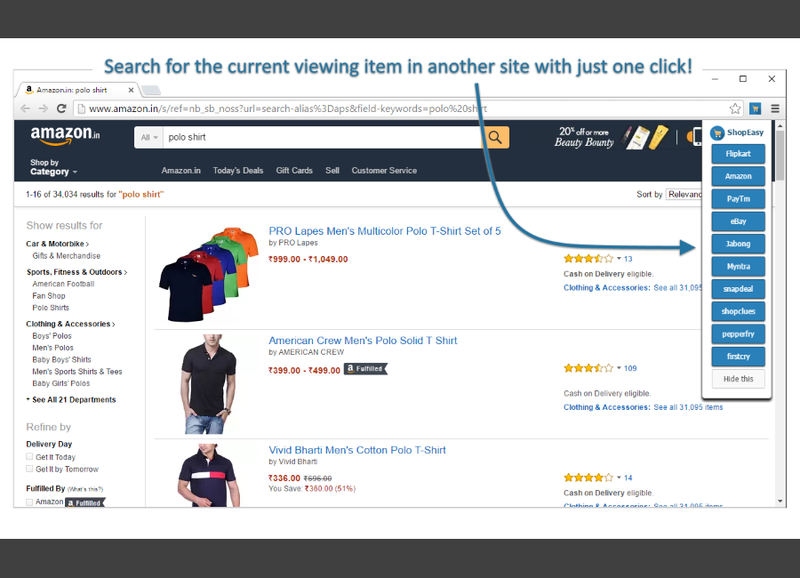 Search for an item in another shopping site, from a different site in just one click. 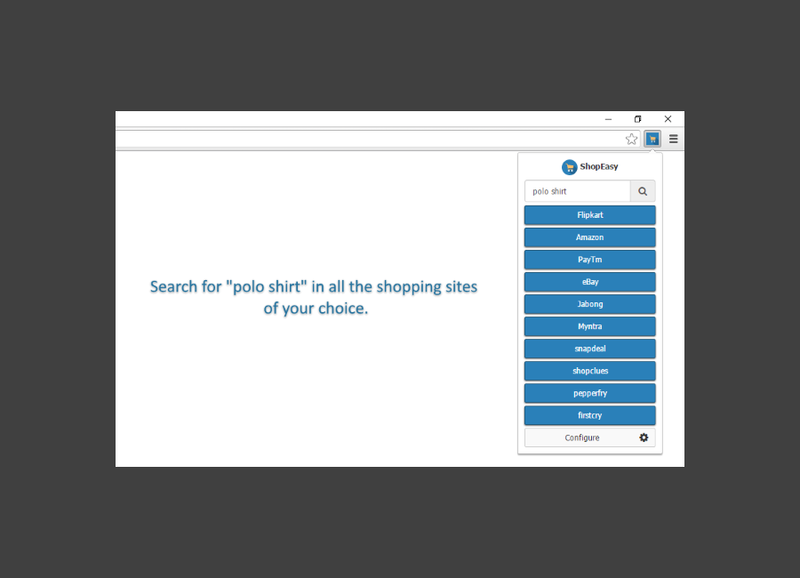 Ability to configure your favorite shopping sites that you want to work with. Give it a try and you will know how easy it is to find an item from various shopping sites which has less price and that satisfies your needs. Would love to hear your suggestion or feedback. ShopEasy is a free to use Shopping assistant for online shoppers in India, created by Apps4u team. Search in all shopping sites quickly! Search for a particular Item from the ShopEasy extension. You have a choice to search for that item in all the shoppping sites OR only on a particular site. Just hit ENTER twice to search in all the shopping sites. From one site, search in another! If you are looking for an item in one site, you can quickly search for the same item in another shopping site in just a click. Use the ShopEasy assistant within the website to do this. If you are searching for one item and viewing another item, ShopEasy will ask you to select an item before you can navigate to another shopping site. You can always close the ShopEasy assistant for few seconds, so that you use the existing website features hidden beneath the asssitant. Work with your favorite shopping sites! 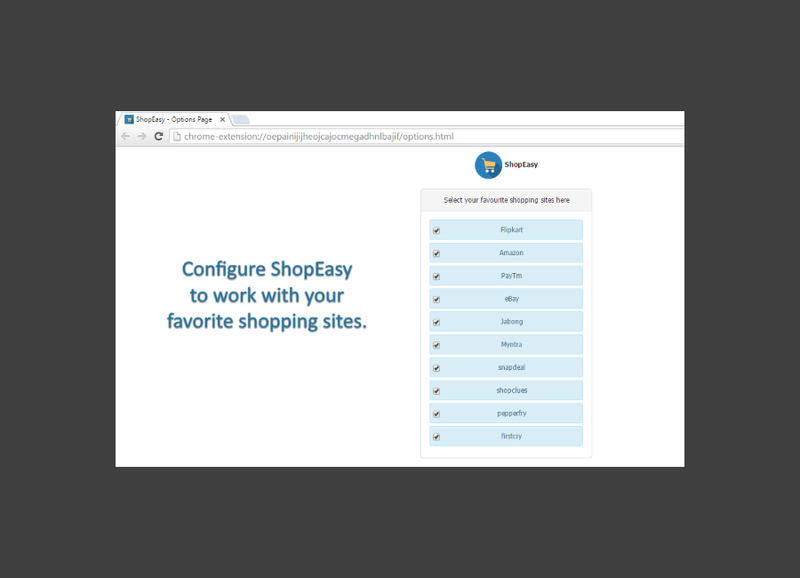 You can configure the shopping sites that ShopEasy should work with. Select from a variety of shopping sites as mentioned here. Supported services: Amazon.in, Flipkart.com, Paytm.com, ebay.in, Jabong.com, Myntra.com, Snapdeal.com, ShopClues.com, PepperFry.com and FirstCry.com. Looking forward to add more services.